5 cylinder, VAG Hall 60-2 trigger, and distributor secondary. TDC after trigger set to 78, corresponding with Hall at tooth 13. Since I only have a single ignition output (Pin 35) I can't shift the ignition order in the ignition outputs visual window, correct? So, the way to adjust the ignition order would be to shift the trigger reference tooth table order, correct? Or, could this be done by adjusting the FTT in the primary trigger visual? Rotating in the ignition visual makes no change either, as it shouldn't. So, how do I change ignition timing order? Actually, adjusting FTT *was* able to correct this. I shifted FTT to 12, adding 72 deg. of rotation, and timing light now flashes correctly on #1 TDC with ignition lock on 0.25 deg. Left TDC after TT the same = 78. Not sure if there is another way to approach this. 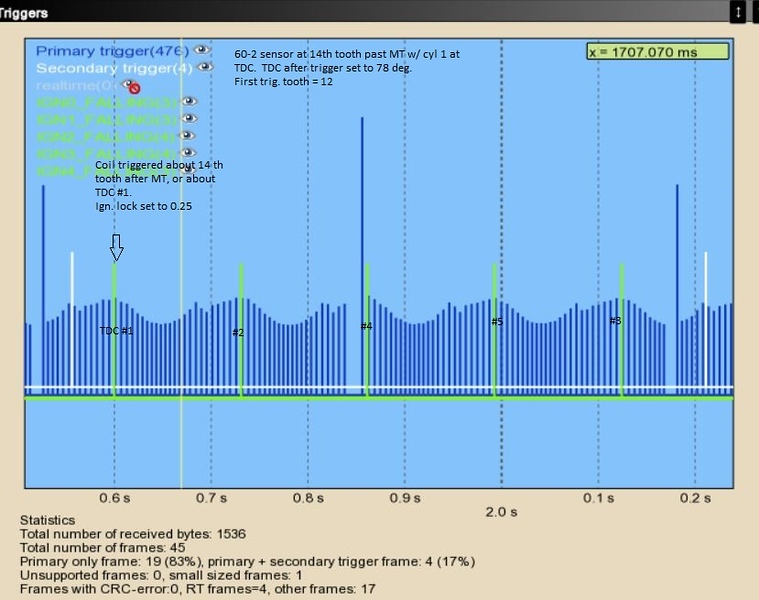 I'm still not sure why shifting the trigger reference table does not affect the firing location. Seems mighty quiet around here... If anyone is listening, I'd appreciate an explanation of this! I can't shift ignition outputs, because I'm running a distributor off 1 output, thus, nothing to shift. I moved FTT to 12, from 0. I left TDC after trigger at 78 deg. So, Id like to understand this! 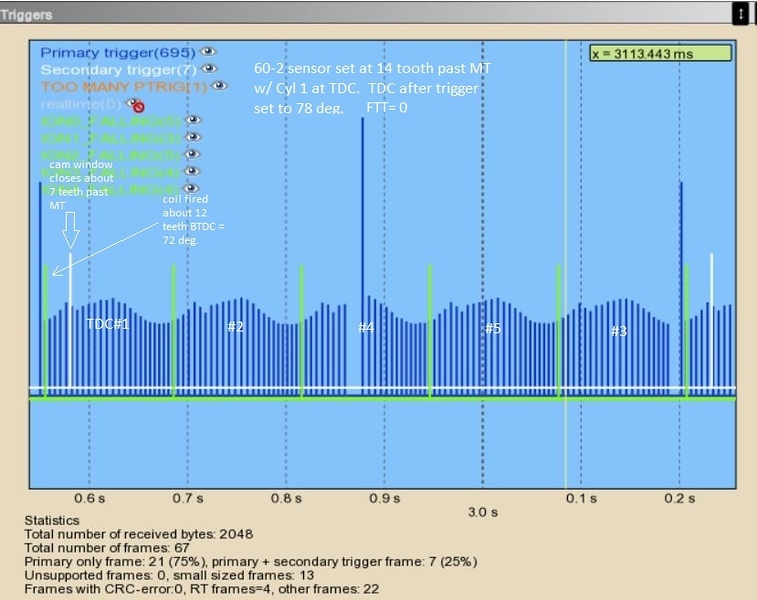 Just reading the help pages about TDC after trigger setting, and FTT, would lead me to conclude that moving FTT to 12 would reduce the TDC after Trigger degrees to just 2 teeth, since TDC after 0 tooth was 78 deg - mechanically fixed. I was able to use the ignition lock to set the ignition to advance all the way to 63, and predictably, it fired #1 almost all the way back to #4. I'm not really looking to make random mechanical botches to help out my fancy EFI. You demonstrated how to setup your car to get ignition to align with TDC of cylinder 1 by using the first trigger tooth value. So 0 refers to TDC on cyl1 in this case now. Say your missing tooth passes the TDC mark on your engine 100deg before the engine reaches TDC. You have two variables to play with to get the alignment right. On a 60-2 each tooth represents 6 degrees. 12*6 + 78 = 150deg total angle. To clarify: My 60-2 wheel is set so that the sensor is pointing at the 14th tooth after the missing teeth when Cyl 1 is at TDC. So 84 degrees of crank rotation from the missing teeth (14 teeth), and 78 deg. if you measure from the first tooth after the missing teeth. 12*6 + 78 = 150deg total angle." But the "total angle" in my configuration is 84 deg, no? Which means If I set FTT to 12, then the reference angle (TDC after..) should only be 12. Unless, the computer is only looking for *any* cylinder TDC, and I'm hung up on Cylinder #1. If that were true, then I don't understand what information the CPU has to actually identify which cylinder it is at in order to fire the coil or injector for. It sounds like either the missing tooth is not 14 teeth away from TDC or that your distributor is clocked incorrectly. I can´t see any other way for you to be off like that. Well, ok. The VAG 60-2 trigger is a rear mainseal type, and was installed with the lock device. I'm pretty sure that puts the sensor at the 14th tooth. I re-checked the distributor, and confirmed that the marks on the hall wheel and housing are in alignment, with the rotor facing #1. Rechecked the wires to confirm they are attached to the correct cylinders. Doesn't this show that with FTT= 0 VEMs is triggering the coil at the incorrect times, and the distributor clock is irrelevant? Additionally, it also shows that the MT are about 14 teeth before TDC #1.